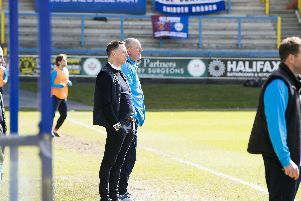 The news that Kevin Roberts and Richard Peniket will both be staying at The Shay next season means Halifax’s squad is really starting to take shape under new boss Billy Heath. So far Heath has signed six new faces, including four from his former club North Ferriby in goalkeeper Tom Nicholson, defender Josh Wilde, midfielder Liam King and forward Tom Denton. Heath has also recruited keeper Steve Drench from Guiseley and defender Scott Garner from Boston. Matty Brown, Kevin Roberts, Scott McManus, Jake Hibbs and Richard Peniket have all agreed new deals at the club, while Kingsley James, Josh Macdonald, Connor Hughes and Jordan Burrow were all understood to be already contracted for the 2015-16 campaign.